A lot of dogs get really nervous when it’s time to trim their nails. This is preventable; especially if you start from puppyhood. Try these exercises to make sure your puppy grows up to be a dog who loves nail trims. For this exercise you’re going to need to use a marker word. A marker word, marks the moment your puppy offers the correct Behavior it also predicts a yummy reward. Check out this blog to learn more about markers! Touch your puppy’s paw (gently barely touching it) and Mark with a “yes” and treat directly after. Try this on each paw for at least five repetitions each foot! Hold your puppy’s paw for 2 to 3 seconds mark with the word “yes” and reward the second your puppy holds still. Be sure to remove your hand from your puppy’s paw when you say “Yes”. This should happen simultaneously. The “yes” for this step should Mark two different things the removal of your hand and the coming of a treat. This is a lot like step two except now we are holding our puppy’s paw for a little bit longer. Hold your puppy’s paw for 5-7 seconds mark and reward the second your puppy holds still. Be sure to remove your hand from your puppy’s paw when you mark. The yes for this step should Mark two different things the removal of your hand and the coming of a treat. This exercise gets your puppy comfortable with you holding his paws. You can’t trim his nails if you can’t touch his feet, right. Be sure to practice these on all four feet! When do you think the best time for practice this exercise is? I bet you have a pretty good idea of this already! If your puppy is jumping around acting wild and is already in it mouthy mood it may not be the best time to practice this, but if your puppy is sleepy and in the mood for cuddles that’s a perfect time. When it’s really time to trim your puppy’s nails you’re going to be manipulating the toes which would also include putting slight pressure on each of the toes. Let’s start getting our puppies used to this. Once your dog is really comfortable with playing the last game we can start adding pressure on to our puppies toes. You know your puppy is ready for this step when you touch his feet and he holds perfectly still no matter which foot you touch. He should be able to hold perfectly still for at least 7 seconds. Placing your puppy’s paw in your hand separate one toe when your thumb slips in between the toes say “yes”, remember that’s our marker word. Once you say “yes” immediately release your hand from his paw and give your puppy a treat repeat that 5 times on each toe on each foot. Do this until your puppy seems comfortable. Step two is going to look a lot like Step 1, except now when we split the toes we’re going to put a tiny bit of pressure on each toe almost like you’re pinching, but much more gentle. The second you put this pressure on your puppy’s toes you’re going to say “yes” and release the paw before giving your puppy his treat. Repeat this step 5 times on each toe on all four feet. If your puppy gets uncomfortable go back to the first game. This step is where we start to add duration. Start by repeating Step 2 only this time you’re going to hold your puppies toe for 2 to 3 seconds instead of just one, once your puppy is comfortable staying perfectly still while you gently squeeze the toes for 2 to 3 seconds then you can build up duration until your puppy can hold still for 4 to 5 seconds and then 6 to 8 seconds. Wow great job guys! Your groomer is going to be so thankful that you took the time to teach your puppy this and if you ever decide you want to groom your own puppy it’s going to be much easier to trim the nails of a puppy who sits perfectly still for nail trims then it will be one who is squirmy and mouthy. The final part is adding in those scary nail trimmers. You can follow along if you have a Dremel just allow your puppy time to get used to the sound the Dremel makes before you try to add it to your puppies toes. 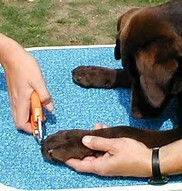 Step one: Gently hold your puppy’s paw in your hand then touch the nail trimmers to one toenail. Then immediately release your puppy’s paw while saying “yes” and give them a treat repeat this at least 5 times on every single foot. Repeat this until your puppy no longer seems interested in the clippers and seems relaxed with all four feet. Step 2: If your puppy was able to do the last step while being calm and relaxed go ahead and clip the very end of each nail. Right after you clip each toe nail say “Yes” as you release your puppy’s paw and give them a treat right after. If your puppy seems uncomfortable, restless or stressed at any point in time go back and practice step one until your dog is comfortable again. Follow these exercises through puppyhood and your vet and groomer are sure to give you compliments on your dog’s wonderful manners. A dog that is calm and relaxed during this process with end up getting much shorter nail, because the groomer will feel more confident that your puppy isn’t going to jump at the wrong time.